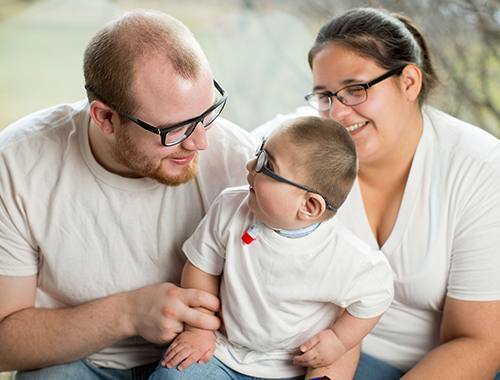 When Karter Malcomson was born, his care team knew it was likely he had a genetic disorder. But a clear diagnosis was elusive. That's when the functional genomics team at Mayo Clinic's Center for Individualized Medicine went to work. And they didn't give up until they had an answer. Karter Malcomson coos and swivels his head when he hears his name in his mother's reassuring voice. "You know we're talking about you, don't you?" Karter's mom, Kerrie, says. "Karter is a very happy boy. He's very content. He's very interested in everything, especially people. He's definitely a people person." His father, Zane, spins Karter upside down on his lap, and they both have wide grins. "Kerrie always says how much Karter loves me," Zane says. "I notice it when I come home from work, and he reaches out to me and wants me to hold him. We have a great bond." Karter just turned 2, but he is delayed in growth and cognitive abilities. He also has a surgically made hole in the front of his neck into his windpipe to aid in breathing. "He's obviously very small, the size of a 6- or 8-month-old, and he doesn't walk," Kerrie says. "He doesn't do any of that normal 2-year-old stuff." Kerrie and Zane knew before Karter was born that he would have health concerns. Karter had stopped growing in the womb. He also grew extra fingers — a sign of a genetic disorder. After he was born at Mayo Clinic's Rochester campus, Karter spent three months in the newborn ICU, but the exact cause of his health problems was unclear. "Before his diagnosis, the wondering was the worst," Kerrie says. "When you just don't know, you're like, 'How do I help my child? I don't know what I'm doing. I don't even know what he has.'" Karter's symptoms didn't place him in any well-defined rare disease category. Even at an institution like Mayo Clinic, which sees more than 1.3 million people each year across a wide spectrum of complex conditions, his care team realized that there was something different about Karter's rare genetic disorder. "It's so complicated. But there's so much potential here for the future." — Charu Kaiwar, M.D., Ph.D. The Mayo Clinic Department of Clinical Genomics consults with physicians who treat patients like Karter, whose case was handled by clinical geneticist Pavel Pichurin, M.D. Dr. Pichurin and his colleagues try to determine the genetic disorder and provide patients with a diagnosis through tests and a review of scientific literature. But what if, after all testing is complete, the symptoms a person has don't match up with the results or the results are inconclusive? What happens if there is no answer? What happens to cases like Karter's? That's where Charu Kaiwar, M.D., Ph.D., comes in. Dr. Kaiwar, a Mayo Clinic research fellow, is part of a group that reviews the cases of people who have exceedingly rare or undiagnosed disorders like Karter's. Dr. Kaiwar is a member of the functional genomics team at Mayo Clinic's Center for Individualized Medicine. The group includes a team of experts in lab science, data crunching and genetics who work together to find genomic-based answers to some of the most puzzling patient questions. That often means sifting through the literature of thousands of cases and information on thousands of genetic variants in a person's body that may — or more likely, may not — be significant. "It's so complicated," Dr. Kaiwar says. "But there's so much potential here for the future." The quest for answers for patients who typically have been bounced around from specialist to specialist in other health care organizations before arriving at Mayo Clinic can become an all-consuming pursuit. "These patients and families are finally able to move on from the constant wonder about the cause of their disease and focus on what they might now be able to predict." — Margot Cousin, Ph.D.
"We are usually the last resort. We could spend hours or months on it," says Filippo Pinto e Vairo, Ph.D., another of the team's research fellows. "That's what motivates us. We are a team that works together with different backgrounds. We know we can share experiences and learn from each other and provide something to patients." The team, which is reviewing about 50 cases at any given time, solves approximately 30 percent of them. And that percentage is rising. "Many patients with an unknown genetic disorder will have spent years managing their health problems while also trying to determine what the disease actually is," says Margot Cousin, Ph.D., a health sciences research fellow. "To be done hunting for the answer, it provides a lot of comfort. These patients and families are finally able to move on from the constant wonder about the cause of their disease and focus on what they might now be able to predict." Nicole Boczek, Ph.D., a molecular geneticist, was one of the leaders of Karter's care behind the scenes for the functional genomics team. Dr. Boczek actually never met the happy-go-lucky boy, but she spent months working on his case. "Karter's testing came back with two interesting variants, both of them within the same gene: C2CD3," says Dr. Boczek. "Only one paper had ever been published regarding this gene related to disease. It overlapped pretty well with Karter's symptoms. But we had to take these findings to the next level and prove these variants of uncertain significance were related to Karter's symptoms." To do that, Dr. Boczek and the team performed additional laboratory testing to show that the genetic variants were affecting protein development and driving Karter's disease. Through the team's work, they homed in on a diagnosis: oral-facial-digital syndrome. This syndrome has at least 13 types, but Karter's case didn't fit in the other 13 categories. It was diagnosed as type 14. "There are nine individuals reported ever in the literature with this condition stemming from this gene," says Dr. Boczek. "Since we've worked on Karter's case, we now are contributing to the literature with four more cases. It is really rare, but it is inspiring." Kerrie says finding an answer to Karter's condition has brought her peace, while Zane said he believes the information will help them in the future. "There's so much potential. 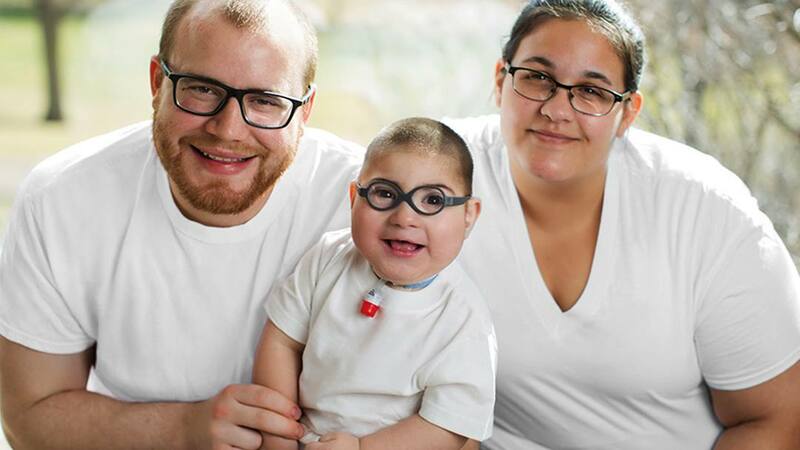 His doctors can only guess at what he'll be able to do, and he continues to surprise us every day," Zane says. "It gives us hope for the future." Karter's breathing, sleep and vision issues are managed by a comprehensive treatment plan. He also works with a physical therapist weekly. Kerrie raves about the compassionate care Karter and the family have received each step along the way. "I really have grown to love the care team he has now," Kerrie says. "I don't have to worry." And Karter, who listens intently and claps intermittently to a musical toy in his living room, has proven the ability to exceed any preconceived expectations. Kerrie and Zane hope one day Karter will be able to meet milestones such as crawling, changing positions and maybe walking. But for now, they're happy that he's happy. "Karter is a happy boy, not someone with health issues," Kerrie says. "He's very personable. He's everybody's best friend." Note: A version of this story previously appeared in Mayo Clinic Magazine. Learn about the Department of Clinical Genomics. Check out the Center for Individualized Medicine.